It’s a homecoming of sorts for Portland, Maine power poppers Marie Stella who are playing Public Assembly tonight as part of the 2010 Northside Festival. The lead guitarist for Marie Stella is former Brooklynite Bryan Bruchman, who some of you may remember from his concert photography exploits as well as his now defunct band, the hard hitting Man In Gray. Though they played here last year at the Stereoactive showcase at CMJ, with a slightly different lineup and a brand new EP under their belts, I think it’s fair to say that tonight’s show is their official NYC coming out party. Just having endured the long car ride from Portland, the whole band (Sydney Bourke, Bryan Bruchman, Matthew Erickson and Max Heinz) was kind enough to sit down and answer a few questions for me before tonight’s big show. Bumpershine: When and how did you get together as a band? MS: Late 2008. Sydney played with the band Satellite Lot and after they broke up she decided to go back to playing her own music and focused on bass. She asked her frequent collaborator Matthew Erickson and Brooklyn-to-Portland transplant Bryan Bruchman (Man In Gray) to play guitar. After a few lineup changes with backup singers and drummers, Max Heinz became the 4th and final permanent member in early 2010. Bumpershine: You’re playing the Pop Tarts Northside Festival Showcase tonight, is this the same lineup of the band that played CMJ in 2009? Are you guys hoping to go on tour at some point in the future? MS: The lineup is a bit different now. At CMJ we had our friend Kat Hulit doing backup vocals and keys and Jon Donnell (now with Wesley Hartley and The Traveling Trees) on drums. We’re starting to get out of Maine for shows a bit now, and will probably do more of that in the future. Bumpershine: You guys just put out an EP called TRUST, had you been playing those songs live a lot before they were recorded, or were they new songs that you laid down in the studio for the record? Do you have any plans for a full length LP? MS: We’d been playing most of those songs for about a year, and put together a collection of the six songs that we thought best represented the strengths of the band. There will definitely be a full length LP at some point, but we’ll probably put out some singles or split releases with other bands while we work up a full album. Bumpershine: I have to ask, is TRUST Elvis Costello reference? Where did the title come from? Bumpershine: How would describe your sound? Who would you say your influences are? 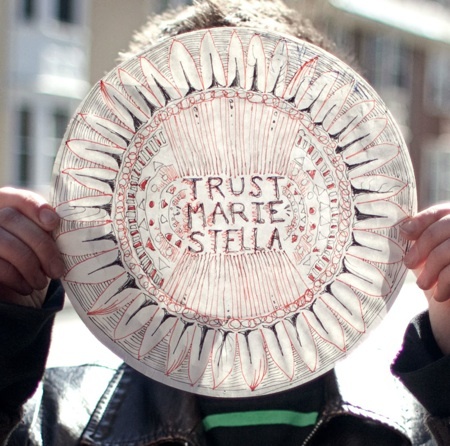 Marie Stella: We hope the best of noisepop, rock, and dance music. We’re still developing. Mike Grimes from Earfam said “a cathartic blast of classic noise rock peppered with infectious hooks throughout that satisfies in the most visceral way possible.” We just went around the room and all picked some influences: Pavement, the Ventures, St. Vincent, Sonic Youth, Morrissey, Broadcast, Stereolab, Rainer Maria, the Thermals, and REM. Bumpershine: What’s the Portland music scene like? MS: Small and incestuous. Everybody knows everybody, and has played in bands with them. There’s a lot support for people’s projects. Bumpershine: Are you excited about the opening of the State Theatre? MS: Re-opening [Pardon me. -ed.]. Sydney is excited about the prospect of local bands getting the opportunity to share the stage with bigger national acts in hopes of steps towards some of the local talent getting a chance at broader recognition. Bumpershine: I’ve been infatuated with Lobster Rolls ever since I read this article. Where’s the best place to get a Lobster Roll in Maine? MS: Sydney’s answer is Gilbert’s, but we usually just get pizza at Otto. Bumpershine: Thanks a lot guys, break a leg tonight!